Clocks (and other goodies) made from books! A book-lovers dream. A conversation peice. Repurposed art. Modern handmade. I'm sure you'll find something here that perfectly fits you! 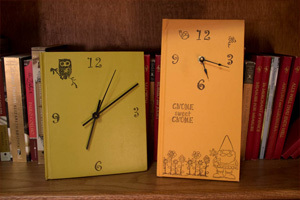 My unique repurposed clocks also make great gifts and will delight not only book-lovers, but anyone who enjoys unexpected combinations and one-of-a-kind products!